Dorm Co. Tip: Keep your hair dryer organized in your dorm cabinet without taking up shelf space! Hair dryers can be really hard to store. All hair styling products are hard to store, but hair dryers are the worst. The long cord unravels and gets in the way of everything. That hair dryer cord also seems to have a mind of its own- it constantly knocks over bottles and other dorm essentials and since it is so bulky, you can't really store it anywhere. It is such a hassle to store a hair dryer that you may have considered throwing it out once or twice ... or every day. 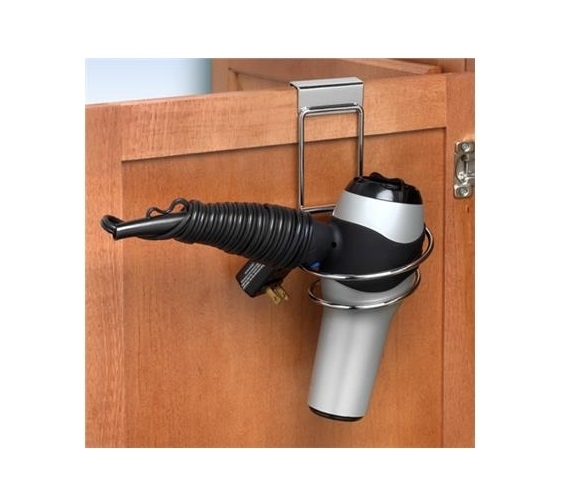 With our Over the Door Coiled Dryer Holder, you don't have to think about throwing out your hair dryer anymore! Our Over the Door Coiled Dryer Holder has a shiny chrome design and coils that wrap around the largest part of your hair dryer so you don't have to worry about it falling over every time you want to store it. The brackets also have padded foam on the part that sits over your dorm cabinet so that you don't have to worry about paying hefty damage fees at the end of the second semester. Our Over the Door Coiled Dryer Holder is a dorm space saver that conveniently holds your hair dryer and saves even more space because the hinge action of the coils folds up when it is not in use. Keep your hair dryer organized and provide plenty more dorm room storage space for other dorm essentials when your hair dryer is stored over your dorm cabinet doors!